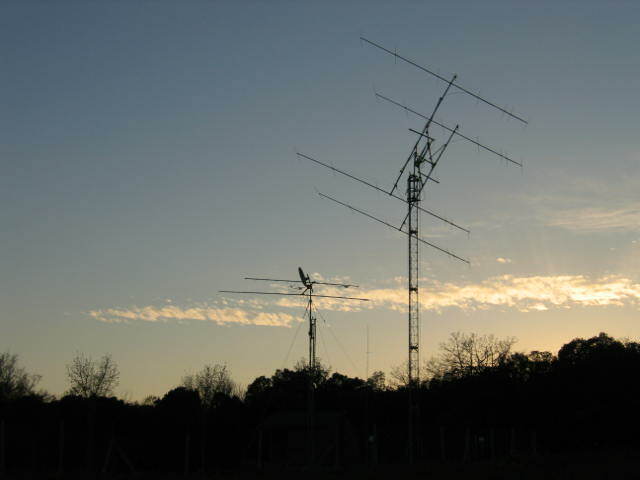 What is the reason for elevating an array for EME trafik on 50 Mhz? Well, on 50 Mhz it's possible to complete EME qso even without a full steerable array: especially stations with a single antenna can find really useful the ground gain (up to 5 db) produced by using a single antenna, horizon pointed, few meter above a flat ground. But we have to consider that the terrestrial propagation on 50 Mhz is a phenomenon which often recurs, even if for short skips. These propagative areas are really unpropitious for EME activity because they scatter or absorb signals avoiding them to reach the moon with the needed force to be bounced off: so the terrestrial propagation is always negative for EME trafik. Using an array like mine, you achieve an angle of attack of the electric wave to the ionosphere around 4,6° respect the ground, optimum for terrestrial propagation but negative if you want to bore the ionosphere reaching the moon when she is rising or setting: in this case, infact, a higher angle of attack (as you can get elevating the array) is to be preferred because it reduces the possibility that the wave radio could be scattered or reflected by the ionosphere, expecially on 50 Mhz. That's the reason why a lot of "horizon only" station on six meter are used to arrange skeds trying to use both first and second lobe of their antennas: many times they (and I personally tested that experience in the past!) can better receive and be received when the moon is in front of the second lobe, around 10°/15° above the horizon, just because at that angle their wave radio is less interferred by terrestrial propagation kind. Elevating the array you certainly loose the ground gain, but you get another great advantage: to cut off the local noise, unfortunatly always present on six meter. Using a steerable set up you can infact drasticly reduce the ionosphere and industrial noise up to several db, making up, in this way, the loosed ground gain. But the most evident benefit is the possibility to arrange skeds for a very long time every month during all the year, even with stations without elevation capability. So, I decided to set up an elevation system capable to reach -1°/ +90° in about 90 seconds (even if at my latitude it is not necessary to elevate in vertical the antennas, it could be useful for particular tests and noise mesurement). 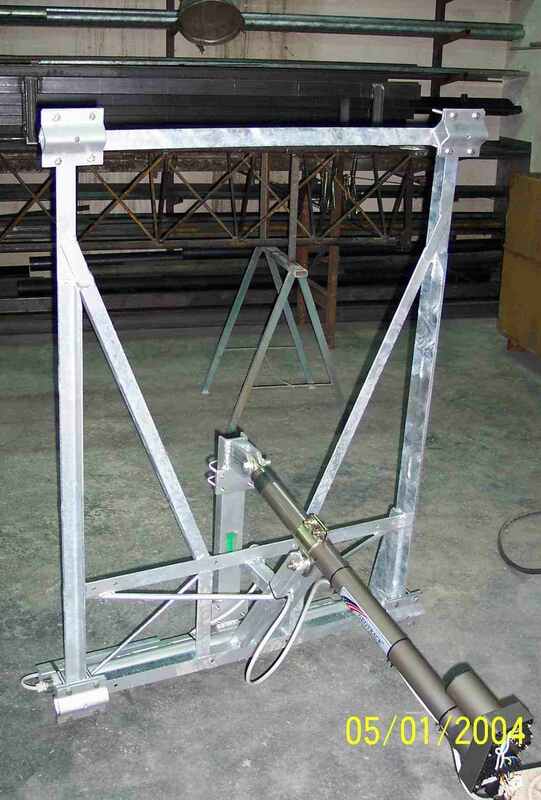 The piston, provided by Prosistel, is the model PST-7524 capable to handle antennas system up to 4,5 square meter. I completed the upgrade on February 06 2004. 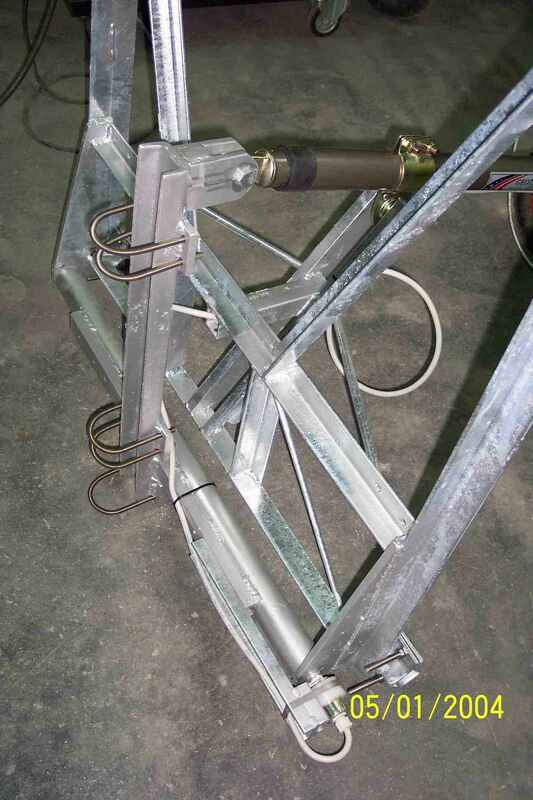 The "double H" mantains the previous features, but the spacing between the two horizontal booms has been reduced from 1,90 meter up to 1,25 meter, introducing more not conductive guys to give strength to the structure. 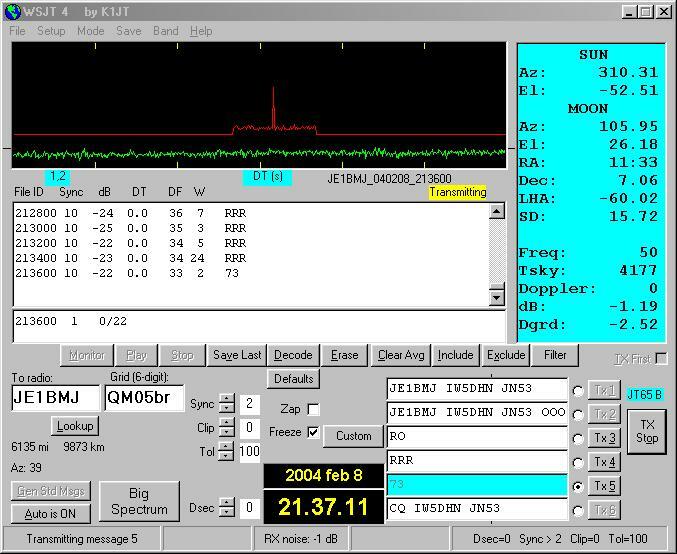 The first qso has been completed with Han JE1BMJ with the Moon at +26° on February 08 2004. After the qso, I lowered the antennas at horizon level keeping same QTF and I found that the local noise was up to 5-6 db stronger! That's the confirmation that elevating the array is a great advantage in detecting very weak signals on 50 Mhz EME!